The data at the end of Cycle 2 reflects the feedback provided by the Shared Mentoring Group in three areas: (1) Specific Chapter Feedback, (2) Overall Product Feedback, and (3) Discussion Group Feedback. Note: Prior to data uploads there was one teacher (1st year) who had yet to take the chapter, product, and discussion survey. The initial report of 100% positive influence on the specific topic was a key element. Not just in the data, but the acquired understanding resonated within the teacher discussions as well. Another positive shift: clarity was provided on a greater scale in terms of the specific learning model within the school. I believe this could have also been impacted by the post-activity discussion - during which teachers discussed their own classrooms within a Blended Learning environment. The only negative data strand in the entire collection: either the teacher was already informed or they felt key information was missing. 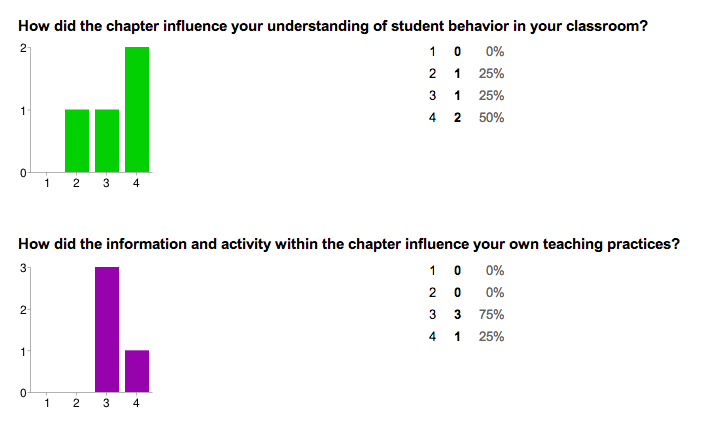 Based on the discussions (see below), I believe teachers felt that not all students were represented in the activity. This could lead to another exercise in which the teachers first discuss the types of students, then create the roles they will fill later on. Again, all teachers reporting positive influences. 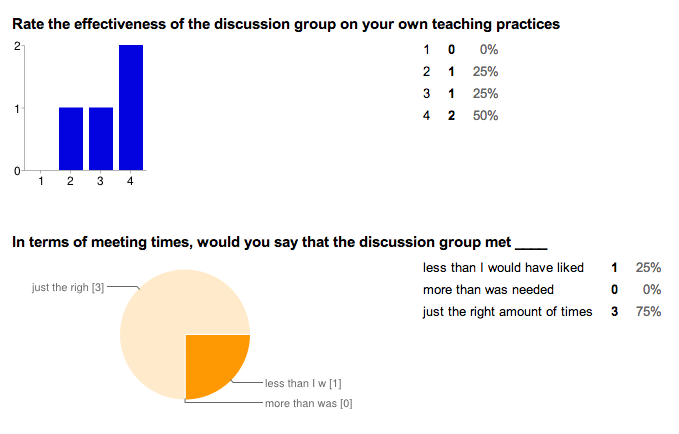 What I appreciated most about the connection between the data and the discussions is that teachers felt comfortable challenging their own practices and being open about making changes. Interesting to see that all teachers rated rigor at a 3. While still positive, it's the only strand of data within the collection that did not contain a 4. While the chapters were sample features, and designed to be at a basic level in terms of the delivery of content, many teachers reported changes in the way they viewed their own practices and teaching. Perhaps they thought of rigor in a typical pedagogical sense (content, reading level, assessment). The fact that they all felt challenged in regards to their typical practices demonstrates that rigor was present, though not in a manner that they clearly identified with. There is an upward shift between effectiveness on practices and the use of interactive sessions. Perhaps this serves the support the theories on Adult Learning (and Constructivist, AND early progressive education) in that hands-on/evident learning is more impactful than typical curricula. Always a positive when dealing with professional development and teachers: nobody questioned the source of the material. I believe this is in part due to a shared approach, rather than an instructor delivery which can often times put teacher/student at odds with each other (something we often see in district professional development sessions with teachers). The last two strands of data represent should be viewed as positive. I would have preferred to see the "Potential Ability to Inform" at all 4's, as this was perhaps the biggest opinion piece they could offer in terms of evaluation. 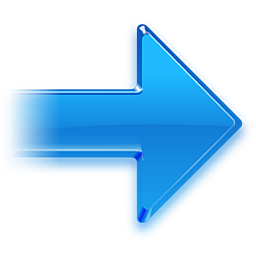 The visual design piece is important as expanded adoption is considered. How could this product be used to influence new teachers coming in at the beginning of the year? This product can be shown to new teachers to the blended model to give them a clearer understanding of the goals of the school, and therefore, the goals they should set in their classroom. I think this product, with a little more meat, could be very effective for new teachers. This product could really help new teachers prior to the start of the school year to help plan instructional practices. It will help explain what is expected of them teaching in a blended model and let them know they are not alone in some of the struggles. 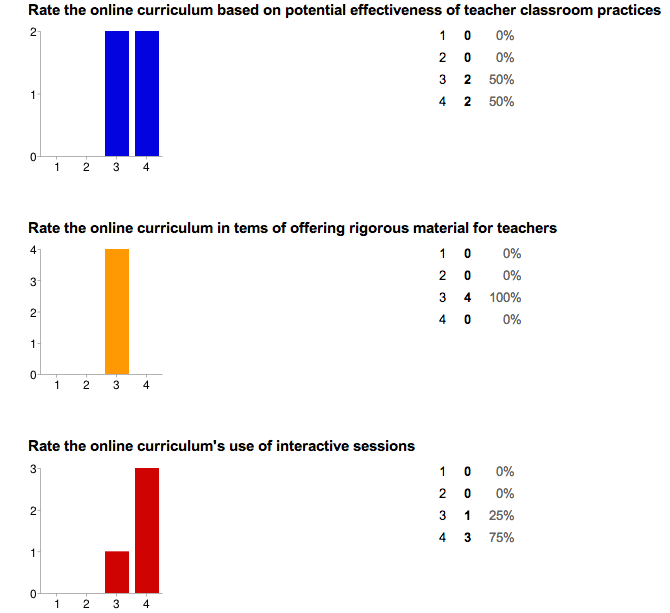 What were the best features of the online curriculum? Since it was online, I was able to complete the online curriculum when I had time, and it did not take me out of the classroom like most PD session do. The videos were a nice feature. I especially liked the video about "Where Do I Stand." That aspect is still one of the biggest things I struggle with in a blended learning school. In what ways could the online curriculum be more successful? I think that the layout and accessibility of this curriculum really lend themselves to the goal of this curriculum. Some parts were a bit wordy and long. Maybe condense a few of the longer sections. I had some issues with logging on / signing up. What's most interesting about the first piece of data is that it contains the only negative strand in the entire collection. I say surprising because the Shared Mentoring Group was designed specifically in response to the data collected in Cycle 1 and through 1-on-1 discussions held with teachers. The entire focus shifted away from digital content and towards providing supports for new teachers. However, the most engaging pieces of data and discussion topics came directly after FLIPPD curriculum samples and activities. How did having a discussion group help you with your problems? It was a good place to realize that I'm not the only teacher with my problems and it opened my eyes to some options I have that I wasn't aware of before as to how I can solve these problems. The discussion face-to-face discussions were great to see how the new teachers felt about their practices. However, if a new teacher could not attend the blog allowed an alternative resource the new teacher could use to post questions and receive feedback from the entire group. Just a good place to vent in a safe spot. If started at the beginning of the year, how could the shared mentoring group and discussion sessions be used to influence new teacher practices? If this was used over the summer or during the opening PD sessions in August, the curriculum would have more impact on new teachers. Knowing what to expect when walking into a blended learning environment is important to lesson the stress of teaching and provide better classroom management. We can grow and develop our skills as a team, which I feel would be much easier and less intimidating than needing to learn so many online modules and interfaces on your own at the beginning of the year. I think if it were a year round thing starting at the beginning of the year it would help give new teachers the feeling that other teachers are there to support and help. It would be easier to address problems as they arise. This has the potential to really help new teachers. In addition to sharing techniques on where to stand, etc, it could be helpful in teaching teachers how to use some of the online programs. That was difficult for me as a new teacher last year. I learned most of the programs by myself. What was the more impactful feature of the discussion group? 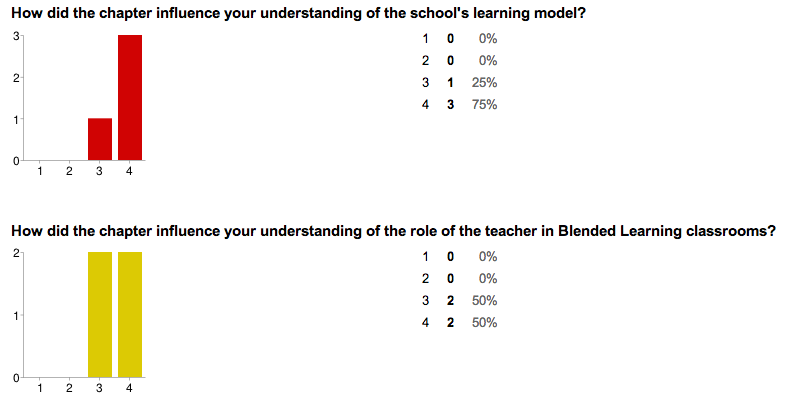 Using the different blended learning models. Understanding the different models and choosing which works best for your students was an important issue to discuss. I think talking about what model classroom we actually have as opposed to what we thought we had was a really great feature of the discussion group. Reading and hearing what other teachers had to say and being able to let them know we are all here for each other. Having a group to share experiences with. I like that the group was smaller, which created a sense of trust and community. I think if the group is too big, people might not feel a sense of connection or responsibility. In what ways could the discussion group experience be improved? Regular meeting times and possibly a year long goal. More teachers. Maybe involve more 2nd year teachers because they probably still need support and help and can help the 1st year teachers. We can meet at a regular interval with more specific ideas to think about from one meeting to the next, kind of like a book club.